The progress of a controversial bill which would allow terminally ill people to be helped to die has been blocked by the House of Lords. Lord Joffe's bill would give doctors the right to prescribe drugs that a terminally ill patient in severe pain could use to end their own life. But peers backed an amendment to delay the bill by six months by 48 votes. Lord Joffe said the move was intended to end the debate, but pledged to reintroduce his bill at a later date. The government has said it will not block a further hearing of the bill. Peers had spent the day in a passionate debate on whether or not it was right to allow people who were terminally ill to be given drugs they could then use to end their life. Lord Joffe had told the house that patients should not have to endure unbearable pain "for the good of society as a whole". The crossbench peer said: "We must find a solution to the unbearable suffering of patients whose needs cannot be met by palliative care." But Lord Carlile said the bill would end with doctors giving lethal drugs. The Lib Dem peer said: "Everybody in your Lordships' house knows that those who are moving this bill have the clear intention of it leading to voluntary euthanasia. "That has always been the aim and it remains the aim now." The bill, which had its second reading on Friday, proposed that after signing a legal declaration that they wanted to die, patients could be prescribed a lethal dose of medication to take. Only people with less than six months to live, who were suffering unbearably and were deemed to be of sound mind and not depressed would be able to end their life under Lord Joffe's proposal. The debate highlighted divisions between supporters of the right to die and those who want better palliative care. 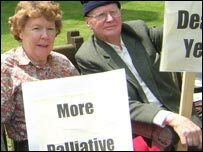 Lady Finlay, a professor in palliative care said: "Let us get on with working for patients to live as well as possible until a naturally dignified death, not taken up with becoming complicit with suicide." Archbishop of Canterbury Dr Rowan Williams was among those against the bill, saying the cost of voting the bill through would be "disproportionately high to the benefit to certain individuals". Speaking on the BBC Radio 4's Today programme, he said there was now a broad consensus against the measure which extended beyond the Church and religion. Cardinal Murphy O'Connor, Archbishop of Westminster, warned it could lead to pressure on vulnerable people to take their own lives. Disability campaigners echoed those concerns, and said the real need was to ensure palliative care could help people have a dignified death. Opponents to the bill submitted a petition signed by 100,000 people to Downing Street, and demonstrated outside Parliament. But the bill's supporters said doctors should be able to prescribe drugs so a terminally ill person suffering terrible pain could choose to end their own life. Labour's Baroness David, 92, supported the bill, saying: "If I were terminally ill, I believe I would be the only person with the right to decide how I died, and whether I preferred palliative care to assisted dying. "It would provide me with an additional option on how to end my life, which I would find tremendously reassuring." Mark Slattery, of the charity Dignity in Dying, formerly the Voluntary Euthanasia, said the campaign to introduce an assisted dying bill would continue. "The bill has faced the an onslaught from the biggest political campaign in church history, but public support for it has held firm. "The bill will be back and the campaign has not stopped." Julia Millington of the ProLife Alliance welcomed the Lords' decision. 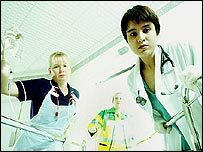 "Legislation that permits doctors to assist in suicide, fundamentally changes the role of doctor from someone who cures or cares to a killer. We will continue to resist any change in the law."